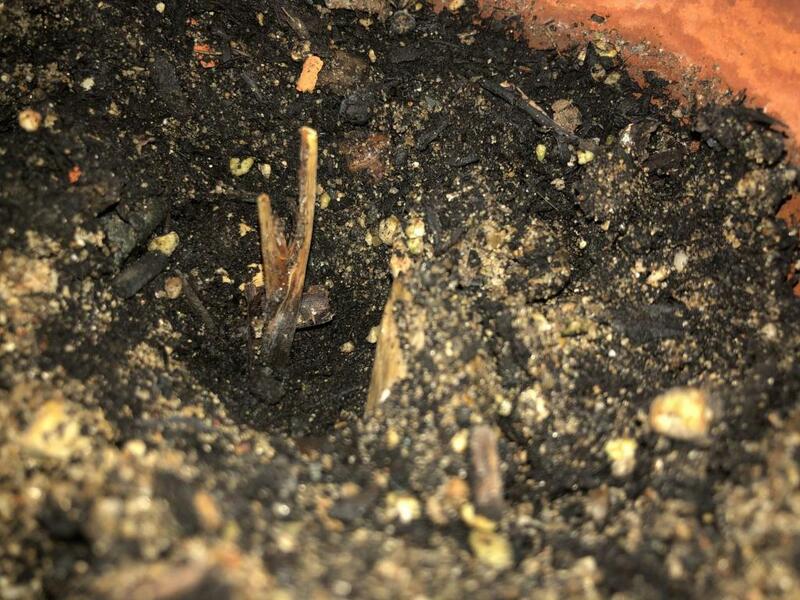 Germinating Phoenix Dactylifera 2.0... tips? Anyway. We moved from our hot 3rd floor apartment to a drafty townhome in the meantime, so I have to find a new warm area to germinate the new seeds. I'm also fuzzy on the process of doing this, since I did it only once before, two years ago. Does anyone have any tips for a better germination/faster growing period/getting them to survive longer? Welcome to PT! 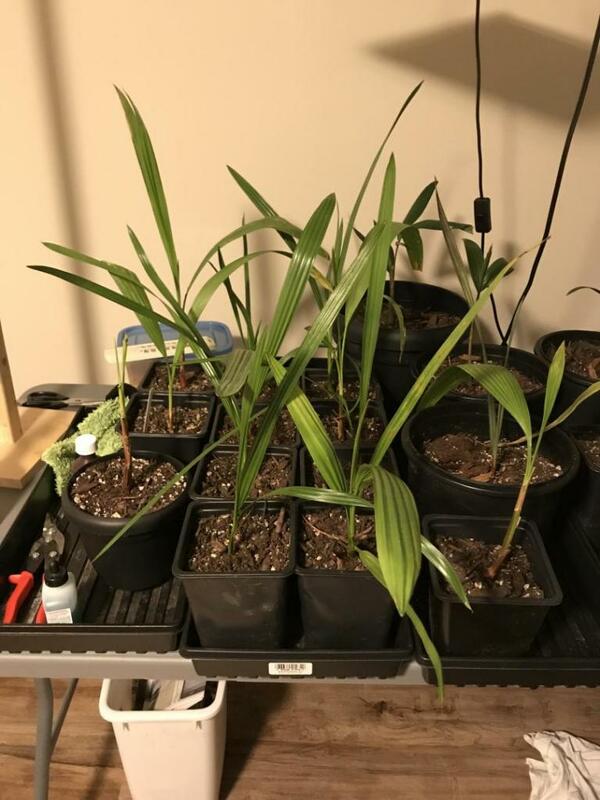 Phoenix dactylifera are pretty tough even as seedlings so it wouldn't surprise me if some of your seedlings survive so don't give up on them just yet. Some pics would be helpful also. How many strap leaves did they have when you brought them inside? If the main center spear is green and the stem still has bright green there's a good chance. The older outer leaves will die off and turn brown regardless of their health. But like others have pointed out there's a good source of seeds for you and they're easy to germinate. Heat and moisture are important, but not too much moisture. I germinate seeds this time of year using just slightly moist orchid moss/perlite mix in a ziplock bag that I place on my satellite box or some other heat source. Once they germinate, pot them up using a well draining mix (not cheap potting soil). Thanks, Jon! I have only one left, and I'm afraid that the basement was too chilly for him, even with the grow light. I also don't over-water them, but might have overestimated their drought ability. I didn't want to overwater (I do fairly infrequent deep waterings, similar to what they get in the "wilds" of Tel Aviv pro gardens) during the colder season. I have one that was the strongest before, and once the leaves were completely dry, I cut them off. I also dug around it a little bit and it looks like maybe I initially buried the seed too deep when I transplanted them to the bigger pots last year? I'm not home so can't take pics, but it really looks like it's completely brown. It didn't pull out of the dirt despite repeated attempts, though, unlike the other two little guys, so I still have hope that he could make a miraculous recovery. He is in my kitchen now, where I can keep a closer eye on him, and which is also the room with the most light other than my rambunctious toddler's room. I mixed the dirt special for these guys, so I'll probably re-use from the pots I mixed before. How long should I keep this one in intensive care before determining that he's plain old dead? I didn't really want to try and dig him up to look at the roots, if he's alive but shocked, because I figure that would for sure be the final straw! Oh, and they had 2-3 leaves when I brought them inside this fall. Dactylifera are pretty easy to germinate. The very first palm I grew from seed was a Phoenix (dactylifera or Canariensis, I forgot lol) that I collected on the Hollywood Boardwalk in Florida. My advice for dactylifera germination is to keep them warm. It takes forever for me to get these to germinate at room temperature. But otherwise they grow very quickly. In a single summer my Dactylifera seedlings will grow almost triple the size of my Sabal palmetto seedlings. Do not keep these too moist. I have had dactylifera seeds get all moldy on me even with the soil just being damp for too long. I am not saying keep them bone dry, but make sure they are not sitting in soaked soil all the time. Reading through everyone's comments, it's becoming more and more apparent to me that what shocked them the most was the sudden change of weather--inside vs outside did not help, with the drafts in our new home. @RickyBobby, how much extra per month/quarter would you say your setup runs you in electricity $$? I mean as a general estimate... also convenient that your climate is the same as mine as I ask that. I think this one is out. 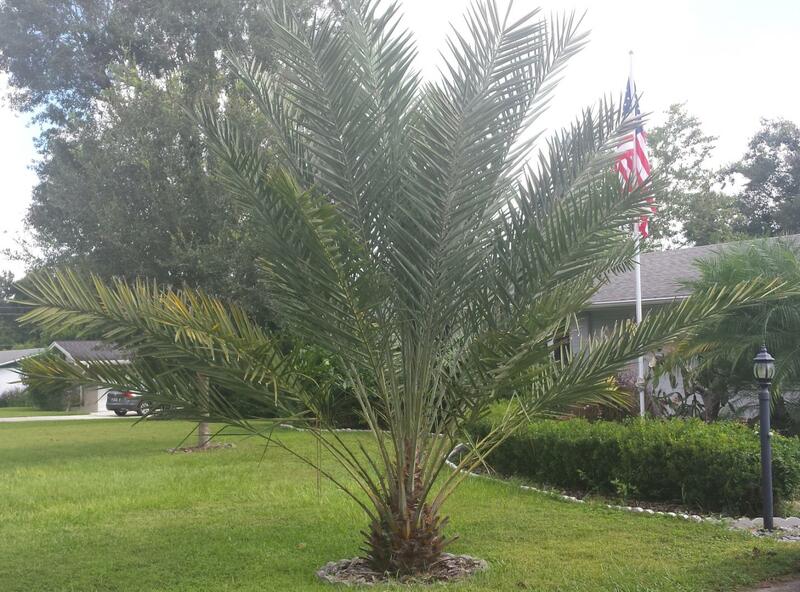 The growing medium looks a little damp and/or poorly draining for a date palm. Best advice for a growing medium for the new ones is to either start with a mix for cacti and amend it by adding some potting soil or go with a 50/50 mix of potting soil and perlite. I personally do the latter. You want it to have some nutrients but drain well. It appears you have the germination part down pat. For heat in your new place, one age old technique is put the seeds in a baggy above your water heater. In my case, when I lived up north I placed them each in their own small pot and place them on a heat mat inside of a 15 gallon aquarium. After placing them in the aquarium, I got a thermometer with suction cups and put it on the inside of the aquarium so I could monitor the temperature and then covered the top with a towel folded over several times to trap the heat. I've had decent germination results anywhere from 77F-100F, but warmer is better. As far as pots, their root systems become extensive very quickly. By their nature, their instinct is to push a root down through the ground until they hit ground water to ensure their survival. At the point their roots touch groundwater they form an extensive root system and their above-ground growth takes off. To mimic this effect, you may want to keep a pot with drain holes and a tray underneath it with some water in it. Be aware that the roots will likely find the holes and attempt to grow out of them, though. In a pot without holes, the roots will tend to grow to the bottom and then wrap around in a circle, following the edge of the pot. It's the dampest spot in the pot, and I've seen one wrap around enough times to push itself out of a small pot. Thanks! I should have mentioned that I just watered it after letting it drain...... I'll take another look at the soil; I mixed it so it would be well-draining, but that was a while ago, and you never know. Thanks for the tips on the water heater and the tray under the pot! I thought dates were supposed to get an occasional "deep watering," while allowing the pot to completely dry in between. Can you please tell me how to work the deep watering and the tray with water under the pot together? I assume it shouldn't stay wet all the time...? If you use a tray, you'll want to keep some water in the try most times. If the soil on the bottom of the pot is dry, you definitely want to water it right away. The water at the bottom doesn't typically cause the stem to rot. Usually, disease comes from the stem being surrounded by excess moisture. I've killed a few in my 16 years of growing them, almost all from over/under watering. I guess I should also mention that I'm assuming you are growing pits from the Medjool variety. I grew pits from Deglet Noor dates and they seemed a little less tolerant of wet feet. To ensure even root development, you'll likely want to water from the top of the pot and let it drain into the tray, but the bulk of the root development will be at the bottom. A close relative to phoenix dactylifera is the Cretan Date Palm (phoenix theophrasti). I've seen both of them fill an entire three liter bottle full of roots with only 2 strap leaves on top of the ground. Look at that nice head!!! Yes, I'm doing the medjool variety. It's a nice little "souvenir," if you will, of my time as an expat. I might also do a pygmy date, too, whenever I can find one, and my pipe dream is a cocos, though I know that will definitely have to wait until we own a home and I have a space all my own that I can heat as much as I like..... I am healthiest in the climate that a palm is healthiest in, so I'm doubly looking forward to this moment! If you're looking for pygmy dates, I have a ton of volunteer seedlings I'm trying to get rid of (preferably alive). Either that, or if you want seeds, I should have ~1,000 come spring time (see photo). I can send you a few come spring time if you don't find any by then. You can actually see some of the parent plants behind the light pole in the photo above. @Rickybobby has a climate similar to yours and grows coconuts from store-bought coconuts. In my case, one of the few zone-pushes I do are coconuts of different varieties; currently, Jamaican Tall, Malayan Dwarf, and Maypan. I was literally just wondering about an hour ago if growing a palm from a store-bought one could be possible!!!!! That's amazing! I thought they needed to germinate in the surf of the ocean..... I guess I am very wrong on that? I would be honored to receive some of your pygmy seedlings/seeds...... I will have to look into how to care for them properly, since the only ones I know anything about (climate-wise) are medjool and cocos. You are lucky to be wrong about that. There are a few threads by @Rickybobby and @Ilovepalm on here about germinating the store bought variety. I'll let them share their expertise. In this area, I haven't done much successful work. Either that or search for "store bought coco" and you'll find a ton of info on in the general discussion forums. 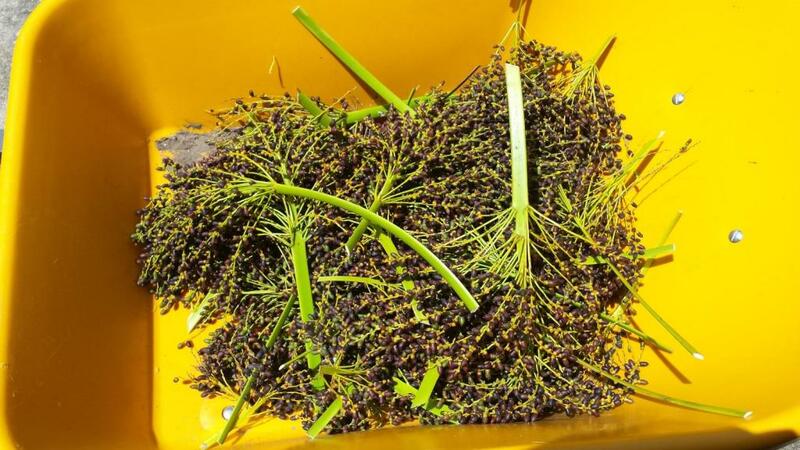 For pygmy seeds, same type of requirements to sprout as a normal date palm. At your latitude, they can gradually be acclimated to full sun in the summer. They do stay somewhere between 8 and 15 feet in height, so the scale is a little better for indoor gardeners, and they are much more tolerant of humid conditions than most other date palms. One area where they are a little weak is cold tolerance; they typically kick the bucket in the low-mid 20s here, with a few outliers defoliating and recovering from lower temperatures. Since they are from Laos, they like a little more moisture. Remind me come spring time and I'll send you a few. I find that my biggest problem germinating dates is if I leave them in the bag too long after they have germinated. So once they germinate I try to get them into a deep pot asap. I also have a couple that I have kept in pots for around 10 years. I take them inside during the winter and have had the in a south or east window as well as under lights with no issues. I find they like to dry out at the top of the soil only so I would not be shy with watering every couple of weeks. Most expensive bill was in dead of winter. Oil heater set at 27c also running 5 led grow lights which give off heat a heat may for my real sensitive guys and an aquarium heater (get into that later) worst bill was an extra 50 bux for the month. I think the dehumidifier running non stop added to that as well. Have not had too much luck with the "True Date" (P. dactylifera), but have had repeated success with P. canariensis (which are EASY). Not sure if this is because Canaries are just easier, I like them better, or they like my conditions better. Try bottom heat. And always easier, outside in SUMMER HEAT. I grow both and I agree that canariensis is just a bit easier than dactylifera. They seem a little more tolerant of overwatering and tend to sprout quicker. My record for germination with canariensis is 4 days and my record for dactylifera is 10 days. I use bottom heat for both. Awesome results. My record for dactylifera is 9 days and my record for a store bought coconut is 4! Nice! I'll let you know when I pick one up. As much as I want to do it now, I think it's best to wait till spring, considering our drafts. I mean we just found out the flue was broken and that's where all our hot air has been going. *facepalm* We're going to move so next winter won't be like this....... we'll see about the coconut. I am excited to try it!! Our Meijer here (mix between Target and Walmart, basically) carries germinated ones like ine week out of the ehole year, abd I was there today and they are there! I am having them hold one for me while I do my other errands but I’m wondering if the short jaunt to the car from te store in 19•F weather would kill it? Any recommendations for avoiding shocking or killing it? Of course the car will be warmed up and I’ll ask it to be double bagged with paper bags all the way around. Any other ideas?